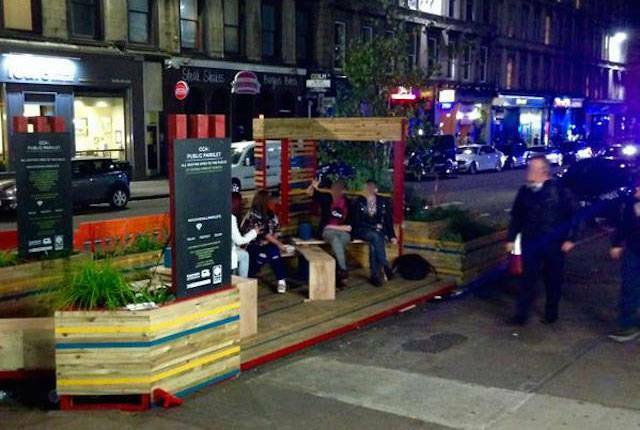 The first temporary ‘parklet’ is now in place outside the CCA on Sauchiehall Street: a new splash of greenery in the city and somewhere to grab a seat and watch the world go by. What’s it for, you ask? We want to help people re-imagine Sauchiehall Street – paving the way for a complete revamp in 2017, when the street will be transformed from Charing Cross to the GFT. The designs that the Council is working on will have more trees, places to sit, more room for pedestrians, cycle lanes, better lighting and more outdoor space for businesses and artists. You can see and hear more about the parklet on STV’s Riverside Show (link valid until 6th October 2015), 25 minutes in. So if you’re on Sauchiehall Street sit down, take a break and let us know what you think. And keep an eye out for other parklets over the next few months… we’ve got more planned.